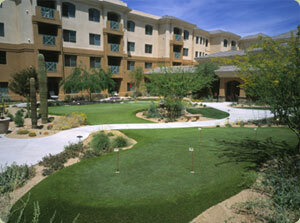 Commercial applications are the fastest growing category of installations for Southwest Greens. With synthetic turf’s minimal maintenance and superb aesthetic quality, many apartment complexes, senior living facilities, rehabilitation centers, golf courses and driving ranges, and even mobile home parks are having Southwest Greens install amenities for entertainment, relaxation and exercise. Day care centers, school districts, and municipalities are installing our synthetic lawn systems for several reasons; minimal maintenance and the products used for installation provide reduced injuries from falls off of playground equipment. Our installations can exceed all government G-Max demands and specs. Playing fields, such as the Texas Rangers practice field in Surprise, Arizona has Southwest Greens product installed in the infield which, unlike real grass, can take the abuse of the hot sun and the constant usage of the field, without the heavy maintenance costs. Some of our corporate clients include: Taylor Made, AOL and SRP (Salt River Project), who have had Southwest Greens install amenities for their clients as well as their employees. Rooftops of commercial buildings are becoming an ideal spot for employees to relax for a moment, or visit during their lunch period. Hotel chains are installing putting courses and greens for their guests to enjoy year round, such as the Westin Regina in Los Cabos, Mexico; the exclusive Shore Club in Miami, the Point Hilton Squaw Peak in Phoenix, Arizona, and not to forget Royal Caribbean Cruise Lines, Ltd., who’ve installed putting courses on two of their cruise liners as an added amenity for their guests to enjoy. For expert commercial planning and design, click on “Dealer Locations”, or contact Southwest Greens Corporate Headquarters.